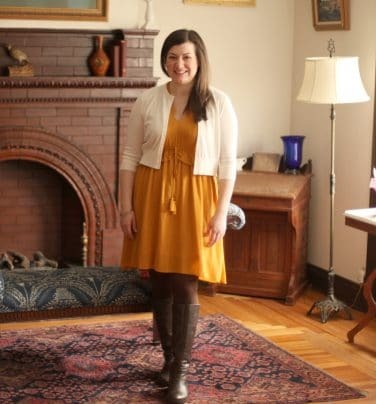 Maria Marlowe opened her Integrative Nutrition Health Coaching practice in New York City in 2013. 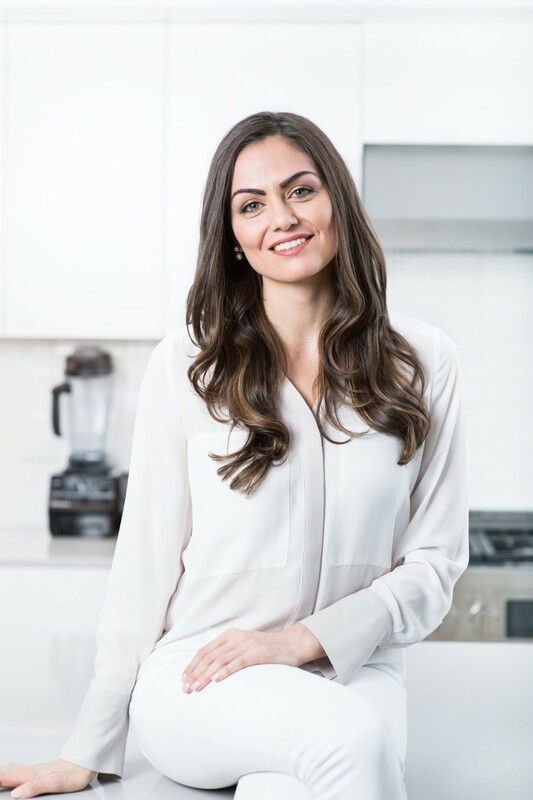 She has since coached hundreds of people, from moms to business executives to celebrities, to improve their health by improving their eating habits. 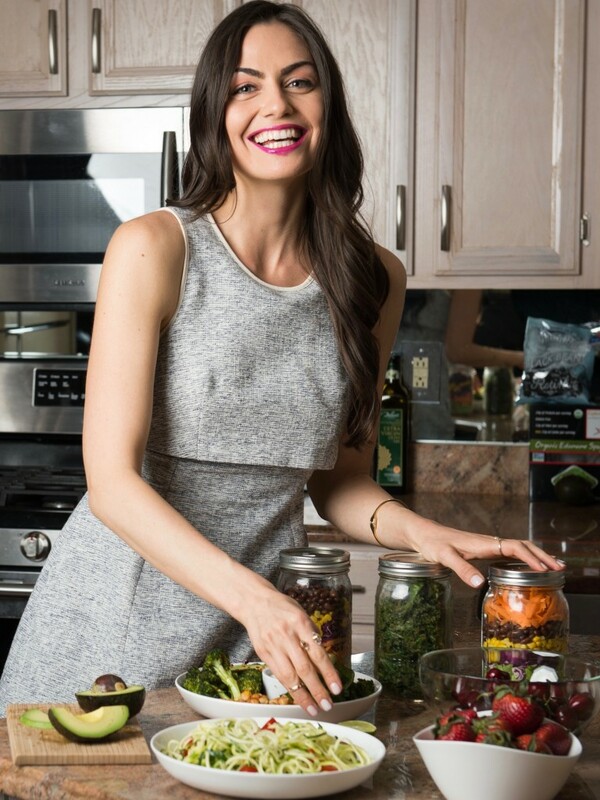 She makes healthy eating and living easy and fun. Maria’s work and recipes have been featured in Vogue, InStyle, The New York Times, Dr. Oz, NBC, CBS, and more. She is the author of the #1 New Release on Amazon, The Real Food Grocery Guide. 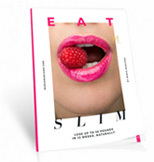 EatSLIM is a 10-week online video course and coaching program that will teach you how to develop healthy eating habits that stick. Thirty minutes or less of instruction per week, that can be watched on your own schedule. A downloadable workbook to follow along with the videos, track your progress, and get the most out of the program. A proprietary food journal that will help you track your meals, moods, digestion, and ailments to discover the best foods for your unique body. 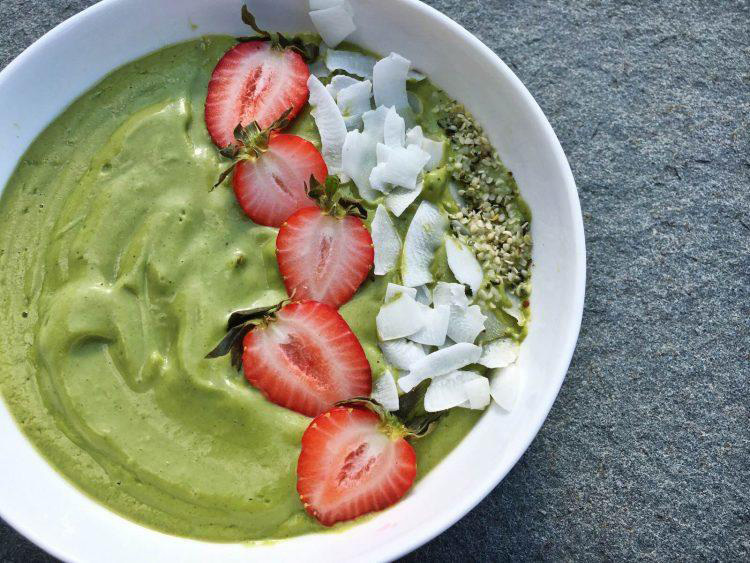 Delicious, plant-based recipes to help you slim down, naturally, and curb any unhealthy cravings. All recipes are dairy-free, gluten-free, refined sugar-free. Eggs & seafood are included. Option for 100% vegan. Option to follow set meal plan or easily customize your own and generate weekly shopping lists. Gain access to the private Facebook Group, where you can meet other members and share your successes and questions. Community is everything! And we are all in this together. Learn what to toss, swap, or keep for the healthiest kitchen. Includes ideas and brand recommendations for pantry staples and healthy snacks and ideas for stocking your fridge, too. No matter where you travel or what restaurant you end up at, this guide will teach you how to make the best selections when eating out. Covers all common cuisines, from Afghan to Vegan. Ask Maria questions at any point throughout the program, and get a written or video response. How-to cooking videos as well as tips and tricks that show you just how easy healthy cooking can be. By Joining the Course, you accept our Terms & Conditions. 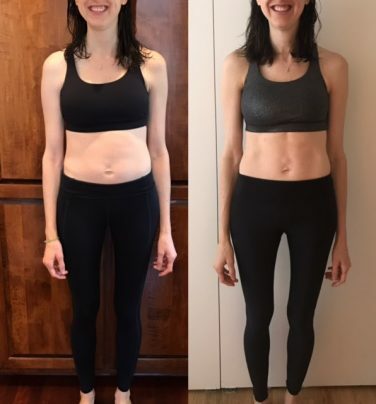 I wasn't expecting to look that different because I wasn't going into this trying to shed 20lbs, but my clothes fit so much better and I feel ZERO bloating during the day. I'm excited to have abs for the first time in my life. I'm thrilled with the results! I looked forward to starting each module every week. I love seeing my husband getting excited about it too. I was never the chef in our family, but whipping up something from your recipe book is giving me more confidence in the kitchen. My body looks better than it did pre baby which is an added bonus. I’ve loved getting to know all the participants through the Facebook group and group calls, too. This program has helped me make a lot of positive changes because it has held me accountable! I always ate pretty well, but now I'm down about 5 pounds and feel like I'm in a much better place. My favorite part was seeing and hearing from other people going through the same program and perhaps struggling with similar issues. It helps to know that you're not alone! This program has really made it accessible to learn how to eat clean and ditch the sweets, coffee, and greasier foods for healthier alternatives. I have LOVED your recipes Maria!!! They are simple, delicious and healthy which is just what I needed!!! It's even inspired my husband to cut back on sugar! Changed my life. Eliminated any emotional dependencies and overeating. I now fuel my body instead of trying to shut down emotion. AND I’ve lost 5 pounds!! I thought that was never gonna happen. I almost wasn't going to do the program because I travel a lot, and had to miss most of the group calls, but it was so easy to fit in the 30 minute modules, and I felt really connected to everyone in the FB group - and I liked that Maria would still answer the questions I submitted on the calls and I could listen to the recording later. "I’m 100% more confident in myself, and finally love, accept, and understand my body. I’m better at meal planning, feel creative in the kitchen, and look and feel my best. I lost 1 pant size, have clearer skin (with less dark circles! ), no digestive issues any longer (which were part of my daily life, before)." 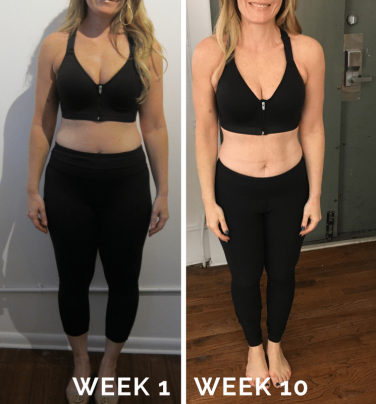 "This program has renewed my commitment to my own health and well-being. Aside from losing over 30 pounds, I feel more energetic, my mood is better, and my skin is clearer. Plus, I can honestly say that I’ve never felt better – physically and emotionally. I’ve gained my confidence back, I feel comfortable in my own skin and I’m not hiding anymore." "This program is life transforming. I used to be hungry all the time to the point I would get hangry, shaky, and couldn’t think. I no longer experience that. 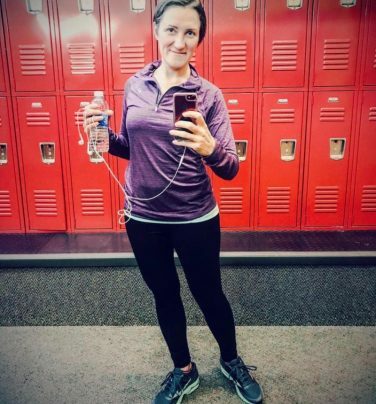 I’ve started to think about my body and food differently, and no longer have any desire for things I used to love to eat but aren’t good for me. My digestion and skin are both better, too." Each FRIDAY you will get access to the online video course, worksheets, and resources. You will focus on developing ONE (or TWO) key habits. (YAY for having the weekend to plan, shop, and prep). Get to know your bod, silence your inner critic, clean out your kitchen, and kick off the program with a slimming 7-day Real Food Detox. AKA how to eat for a flat stomach and fire up the fat burn. Oh, and get ready to talk about poop, gas, and all that fun stuff. Kick sugar (and other cravings), painlessly. No, seriously... you won’t want sugar anymore. No pills or potions here! Learn what, how, and when to eat to slim down with real food. Everything you need to know about making the best choices whether vegan or omnivore One of the most impt. classes! Good fat makes you skinny. Bad fat makes you unhealthy. How to distinguish between the two, and use fat to get thin. You know what’s coming. Promise we’ll make it easy. Yes. Yes it is. Here is what to do about it. Master food labels, decipher buzz words, figure out WTF a GMO is, and learn how to select the healthiest packaged foods (Oh and save $$$). Coffee? Alcohol? Supplements? Plus, how to eat out, date, and travel while maintaining your healthy habits. & Become Your Healthiest YOU!